Let me start out by saying that I live in the desert. Yes, 120-degree summer days desert. Our normal annual rainfall is less than 4". Blowing sand is common when it's windy. We do have days when main roads are closed due to blowing sand. However....snow? What the heck is snow? Oh I know, it's what I see when I look at the mountains! A week or so ago we were taking a load from Minnesota to Lemoore, California. We had about 34,000 pounds of empty glass bottles in the box behind us. I drive the night shift while my trainer drives the day shift (I get more driving hours this way). The weather wasn't too bad. Our route is on I-80. The evening started out clear, but cold. Then the rain started, and then the snow. At first it wasn't sticking, just falling fast and hard. As I came closer to the Nebraska/Wyoming border, the snow started getting worse. Lucky for me it was beginning to get light. It makes it easier to see. Just past the state line near Pine Bluffs the wind was blowing the snow so hard that I had a near white-out conditions. Because the snow was so dry and the wind blowing so hard, the snow wasn't sticking to the road very well. I was able to make out the white line against the darker pavement and could see for 100 feet ahead of me. I woke my trainer up and said I needed advice. His advice: pull into the next truck stop. We stopped at Pine Bluffs, Wyoming with over a hundred other trucks. What a pain! We were there almost 24 hours until the interstate was open and we could get out of the truck stop. What an introduction to driving in winter weather! What did I learn from this? Always, always know where you are in relation to safe havens- truck stops, rest areas, etc. My company does not allow us to pull off on the side of the road or on freeway ramps, so we must use large parking lots (thank you WalMart), rest stops, truck stops, or other places deemed safe. You can watch the Weather Channel for information or use your CB to see what is going on, but remember, nature will do what nature will do - no matter what the Weather Channel says. Be prepared for everything and anything. Keep a warm jacket, boots, gloves, and a warm hat. 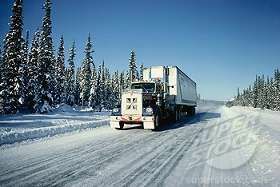 If you are in your own truck I would keep an extra blanket, food that's simple to eat, and some way to keep warm in case your truck will not run. I plan on using some earthquake supplies, and "Heater Meals" that are available in truck stops. We made it safely through my first blizzard! Glad this is spring and it shouldn't be a problem again. If only I knew the future I'd not be so sure of no more problems. But that's for a later blog. Keep the bugs off your glass and the bears off your ... tail. God bless and drive safely. Farmer Bob.